Qui e’ stato rinvenuto il 4o palazzo minoico di Creta che e’ anche l’unico ad essere stato portato alla luce senza subire precedentemente saccheggi. Fu edificato nel 1600 a.C. circa. Comprendeva 180 stanze e si estendeva per circa 8.000 m2. Gli scavi sul posto ha cominciato il sig. D. Hogarth ma il ruolo piu importante lo ha avuto il professore Platon. Il palazzo dell’antica Zakro e’ piu piccolo degli altri ma e’ simile a quelli di Cnosso e Festo. Si sviluppa con ritmo labirintico attorno ad un cortile centrale lastricato ed ha tre entrate ad ovest ed una principale ad est dove e’ stato rinvenuto un altare. Nella parte occindentale del palazzo sono situate le stanze dei dignitari, mentre nella parte nord vi erano stanze per i simposi fornite di lucernari, sono state riinvenuti anche dei grandi bacili che avevano carattere adorativo. Gli appartamenti principali e i vari laboratori della parte est e sud. La locazione del palazzo era di grande importanza poiche’ permetteva scambi commerciali con l’Oriente ed anche con gli altri palazzi dell’isola. Sono stati ritrovati anche molti vasi nel tesoro del palazzo. Tra questi importanti ritrovamenti si distingono grandi spade con foglie d’oro, avorio, oggetti decorativi in rame provenienti da Cipro ed un’anfora raffigurante un tempio ed animali selvatici. Molti di questi ritrovamenti si conservano nel Museo Archeologico di Iraklio. 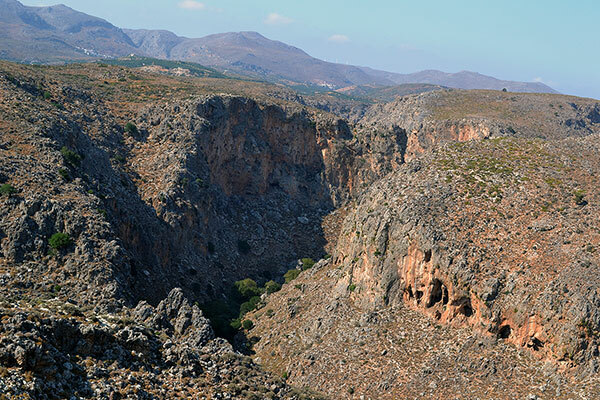 Il «Canyon dei Morti» e uno dei piu interessanti canyon di Creta. Si trova alla fine del sentiero europeo E4, inizia dal villagio Pano Zakros e termina sulla spiaggia di Kato Zakros. 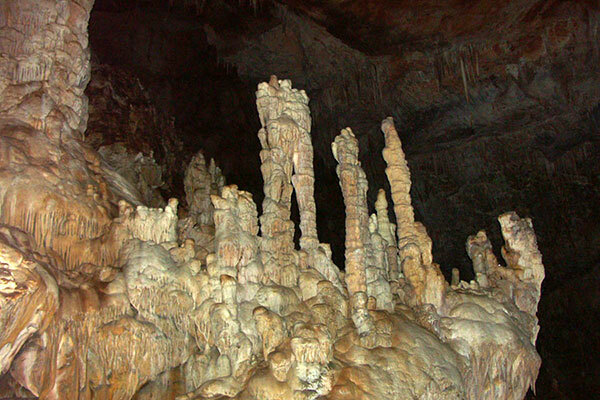 Il nome «Canyon dei Morti» e stato dato in ragione delle svariate tombe Minoiche ritrovate nelle grotte dei suoi precipizi e che sono visibili durante le escursioni, come anche le varie formazioni geologiche che, come delle opere d’ arte, creano uno scenario fantastico.Il canyon e pieno di vita e a causa della sua naturale bellezza i Minoici credevano che se ivi sepolti, avrebbero continuato la loro vita dopo la morte in questo stesso luogo. Le escursioni sono possibili in estate come in inverno, alla fine del percoso, un po’ prima di arrivare nella piana di Kato Zakros, sono state allestite pareti di scalata per coloro che amano questo sport. Una speciale menzione merita la grotta di « Pelekita », una delle piu grandi grotte di Creta. Si trova ad una distanza di 5 km da Kato Zakros ed e raggiungibile a piedi o con un’imbarcazione. Ha una lungezza di 310 m e termina in un piccolo lago con acqua dove scavi realizzati al suo interno hanno riportato alla luce sceletri umani ed anche tracce di presenza umana dall’epoca neolitica. Vicino alla grotta esiste un antica cava di pietra calcarea (pietra porosa e morbida) donde deriva la sua denominazione. I muri del cortile del palazzo Minoico sono costruiti con questo stesso tipo pietra. 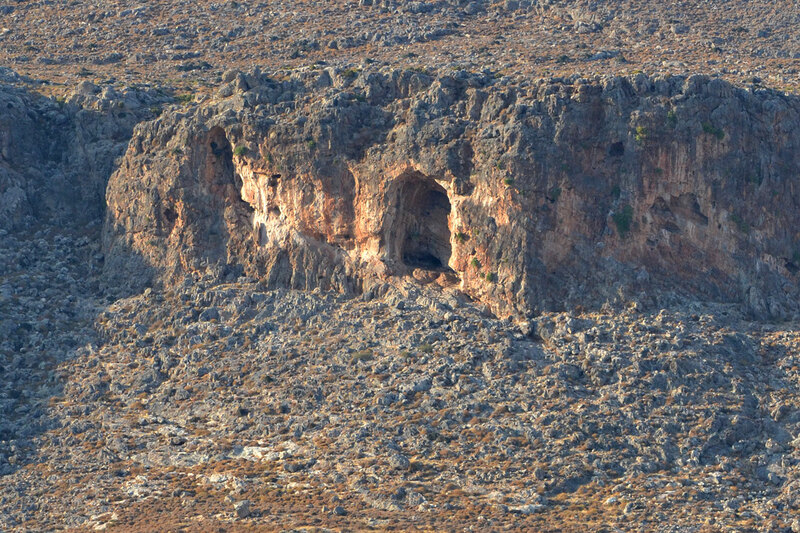 La «Spiliara» e un’ altra grotta del lato nord della piana di Kato Zakros, era la grotta sacra dei Minoici, da non perdere! In macchina o a piedi, per i piu coraggiosi, potete salire a Zakros dalla vecchia strada che univa i due villagi prima del 1985, anno in cui e stata fatta la nuova. Si tratta di una strada sterrata in buone condizioni e che in alcuni punti si snoda ai margini del canyon, offrendo una magnifica vista. Continuando la vostra escursione, non mancate di visitare le fonti di Zakros, lasciando per un po’ la selvatica bellezza di Kato Zakros per prendere una boccata di freschezza tra i platani che ombreggiano le fonti. A small, easily accessible gorge, starts from the village Chochlakies and ends at the beautiful bay of Karoumes. 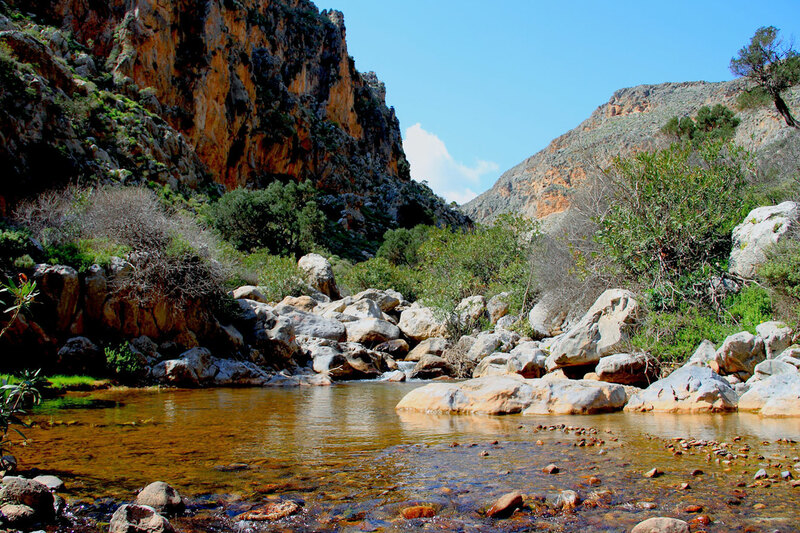 The walk through the gorge, leading mainly through the riverbed, takes about two hours' time, starting from the village Chochlakies and another two hours' time for the return journey to Chochlakies. In springtime you must be prepared for some rock climbing in order to get round the pools of water. At the end is the lonely but beautiful beach of Karoumes where trees give shady resting places. This is actually the last part of the E4 European Long distance path in Crete. The unique palm grove in Europe with its beautiful beach and crystal clear sea on the northern edge of the province over Cape Sidero, is a unique beauty corner of Cretan land. The palm trees here are native and their clusters cover most of the small ravine up to the sea. Apart from aesthetics, Vai also has a great biological value. The wetland created between the Palm Tree and the beach is important for bird life, while a vast wealth of marine life is developing in the sea. 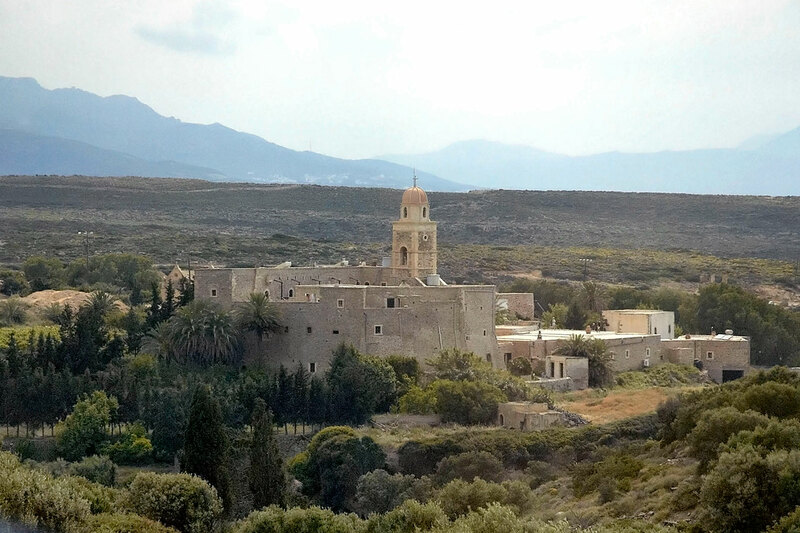 Toplou monastery is one of the most significant monasteries in Crete, dedicated to Panagia (Virgin Mary) and St. John the Theologian. It was founded around the mid 15th century, probably on the ruins of an earlier convent. The monastery was plundered by the knights of Malta in 1530 and shattered in 1612 by a strong earthquake. Due to its strategic position, the senate of the Republic of Venice, then ruler of Crete, decided to financially aid in rebuilding it. The monastery flourished until the surrender of eastern Crete to the Turks in 1646, after which it was abandoned for a long time. In 1704, it acquired special protection privileges from the Patriarch (i.e., stauropegic) and was re-inhabited. After its monks were slaughtered by Turks in 1821 during the Greek Revolution of Independence, Toplou was again deserted until 1828. In 1866, during the massive Cretan revolt against the Turks, it was once again devastated. During the German occupation of 1941-44, Toplou was providing shelter to resistance fighters and housed their wireless radio. When this was discovered by the Germans, the abbot and two monks were tortured and executed. 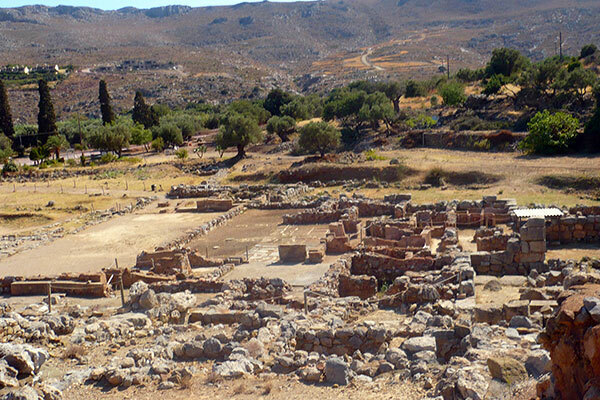 The ancient Itanos was one of the strongest cities in Crete, especially during the Hellenistic and Greco-Roman times. The name comes from its founder Itanos, who came from Phoenicia. Its territory, during its peak, stretched from Cape Samonio (current Cape Sidero) to Cape Erythrae (current Cape Goudouras). The city flourished due to glass trade, fishing and trade of Tyrian purple, the red dye coming from shell extract. Koufonissi Island, which was owned by Itanos, was famous for the production of purple. Also, in Palekastro was located the temple of Diktaean Zeus, which brought big profits in the region. Today visitors can walk through the archaeological site and admire the various ruins such as the large tower on the western acropolis built by black stones, the large Christian church in the eastern citadel of the Hellenistic settlement, the two Early Christian churches at the foot of the hill that leads to Vai and the cemetery outside the town. 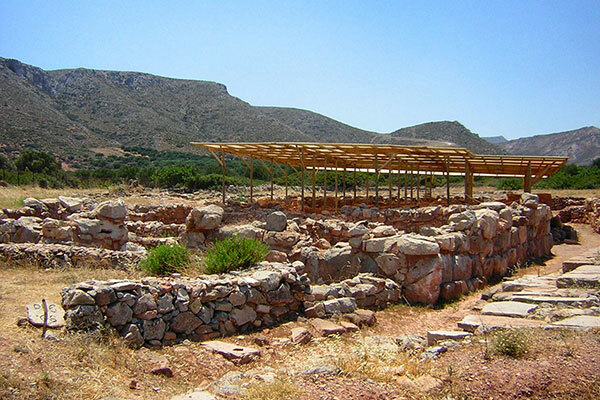 What we call "Palekastro" today is a Minoan town unearthed at the Rousolakos location near the modern town of Palekastro. 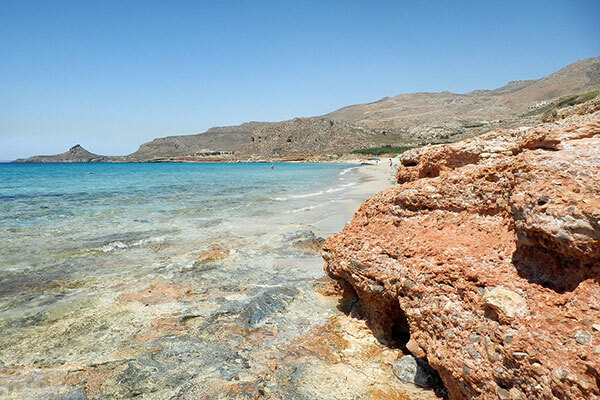 It is located strategically at the East shore of Crete adjacent to the sheltered harbor of Chiona, a few kilometers North of the palace of Kato Zakros. The life of Minoan Palekastro came to an abrupt end in 1400 (or 1500) BC at the same time the other Minoan Palaces and towns, and while there is no conclusive evidence, the volcanic eruption of Thera, or foreign invasion, or a combination of the two appears as the most likely cause for the catastrophe. The ruins at the archaeological site that has been excavated must comprise a very small part of a vast settlement. One gets the feeling that the olive groves beyond the site itself hide a wealth of minoan secrets under their soil, and in fact, fragments of pottery along the beach, and large stones on the headland that frames the sandy beach to the South testify to the abundant existence of archaeological ruins and artifacts. 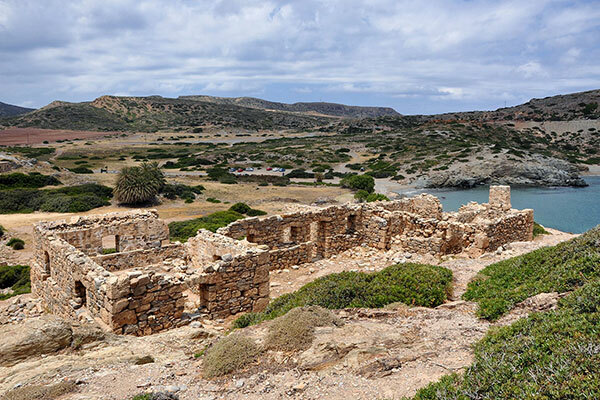 The settlement of Xerokampos is one of the most remote areas of the island. It can be accessed through the asphalt road coming from Zakros. In Xerokampos the landscape is arid and truly eerie, characterized by bare rocks and steep mountains. The vegetation is limited to bushes and there are some places with a few olive groves. Xerokampos is ideal for relaxing holidays and is not suggested for party animals. 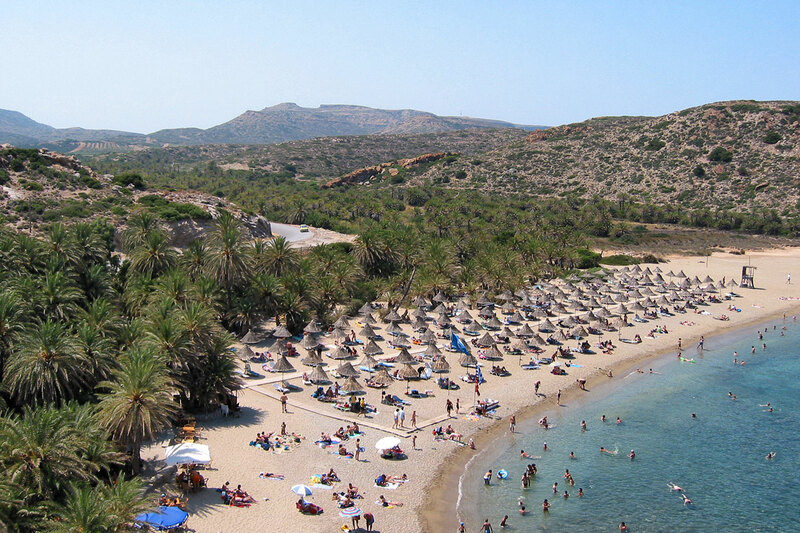 Xerokampos wild mountains are in direct contrast to the calm sea and the beautiful beaches. In a relatively small area you will actually find all types of beaches, as there are beaches with rocks, coarse pebbles, small pebbles, golden sand, white sand and turquoise waters, while there is also a beach with clay for lovers of natural spa!